Many Zimbabweans are confused and anxious about what has transpired and continues to unfold in our nation. While the changes have been rapid in the last few days, the real deterioration has been visible for everyone to see for a long time, especially during the public political rallies of the ruling party, coupled with the deteriorating socio-economic situation. 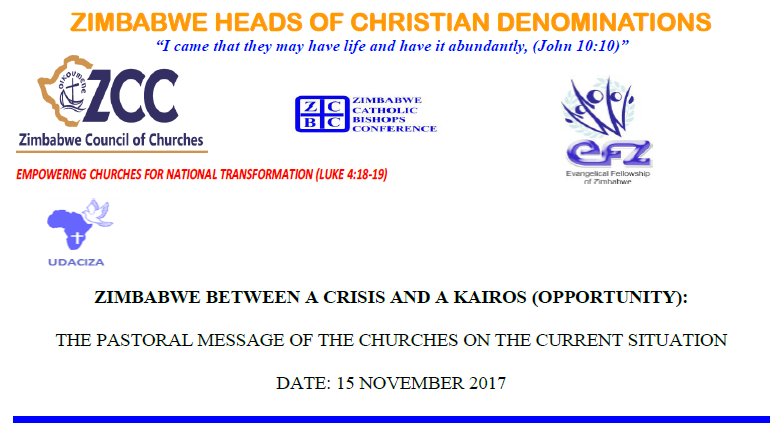 On the 30th of October 2017, during the signing ceremony of the Memorandum of Association between Zimbabwe Catholic Bishops’ Conference and the Zimbabwe Council of Churches, it was highlighted that the abrasive and exclusionary politics, characterised by increased use of ethnic identities that was now dominating the public discourse, would further fragment and threaten the already weak cohesion of our society. Now we have reached a new chapter in the history of our nation. As we look at this situation as the heads of churches in Zimbabwe, we are reminded of the warning of Jesus in Luke 19:41-44. Jesus weeps over Jerusalem when he saw the catastrophe of its destruction and the massacre of the people that was imminent, “because they had not recognized their opportunity (KAIROS) when God offered them” (Lk 19: 44). We see the current situation not just as a crisis in which we are helpless. We see the current arrangement as an opportunity for the birth of a new nation. Our God created everything out of chaos and we believe something new could emerge out of our situation. But first we must properly define our problem. Proper naming of the problem will give us a clear sense of where we must go as a nation. It may be easy to describe our problem in terms of the economy and the accompanying myriad of social challenges. But all these are manifestations or symptoms of a deeper disease that has affected the nation for a long time. Ours is the challenge of the loss of TRUST in the legitimacy of our national processes and institutions. There is a strong sense that our hard-earned constitution is not being taken seriously. There is not enough confidence whether the separation of the three arms of the state, the executive, the legislature and the judiciary are functioning in proper relationships of checks and balances. There is a deep concern that there seems to be no clear distinction between the ruling party and the government. There is concern that the priorities of the poor have become relegated to charity of those who have access to national resources without proper commitment to addressing the root-causes of these problems. There is a general feeling that the wheels of democracy have become stuck in the mud of personalized politics where the generality of the citizenry plays an insignificant role. It is this lack of democratic renewal and the resulting stagnation, sterility and fatigue that has culminated in the current situation. But the current situation is not only the doing of the ruling party and government. It is also the result of the connivance of the different arms of the state and complicity of the church and civil society. All of us at some point failed to play our roles adequately. The church has lost its prophetic urge driven by personality cults and superstitious approaches to socio-economic and political challenges. Civil society over time has become focused on survival and competition and lost the bigger picture of the total emancipation of the population. The current situation is also a result of the many people in the ruling party who feel outdone, but have enjoyed unbridled access to the trough of patronage. Also, journalists fanned the politics of hatred by giving it prime space in the name of sales and profits. In a way, all Zimbabweans must take some level of blame for our current situation. We call the nation to a moment of prayer for repentance, deep reflection and discernment. We all need to go before God and ask God to forgive us for ways in which we contributed to the situation through neglect or wrong action. We need individual and collective deep reflection on what this means for all of us as individuals, families, churches and the nation. We need to find meaning in this situation which may appear meaningless. We need collective and individual discernment on what should be the next direction for us as a nation. Right now, there is not enough information and many people are peddling opinions as facts especially on social media. Some of this misinformation is causing despondency and fear. We are calling for peace and calm. Let us not sensationalize the situation but encourage calm and be modest in our engagement. We are aware that the Zimbabwe Defence Forces is currently managing the situation. But we want to make it clear to them that it is their responsibility to ensure that human dignity and rights are respected. Human life is God-given and is therefore sacred. All human beings, no-matter the wrongs they will have done, have rights. This is not a time to allow for lawlessness and vindictive and selective application of the law. The Zimbabwe defence Forces have stressed that theirs is not a military coup, but an effort to manage the current situation. In the light of this position, we are calling for the formalization of a transitional government of national unity that will oversee the smooth transition to a free and fair election. Finally, we are calling the nation to a table of dialogue. The current situation gives as an opportunity to reach out to each other. There is no way we can go back to the political arrangements we had some days ago. We are in a new situation. But our shared future will only be realised dialogue. This dialogue cannot only happen within the ruling party. What we need is a National Envisioning Process (NEP) that will capture the aspirations of all the sectors of society. The church alongside other stakeholders in the private sector, academia, and other spheres can establish this NEP as an inclusive space to enable Zimbabweans from all walks of life to contribute towards a democratic transition to the Zimbabwe We Want. The church derives its mandate from its calling as a sign of hope, especially in a situation of despair and discouragement. God has put the church in the nation so that it can be a conduit for the healing of the nation. God has promised that: “If my people who are called by my name humble themselves, pray and seek my face, and turn from their wicked ways, then I will hear from heaven, and forgive their sin and heal their land” (2 Chron. 7:14). We are the people of God who are being called to champion the spirit of reconciliation. The church is made up of those who have been reconciled to God and hence is called to be a sign of this reconciliation by calling the nation to reconciliation. Zimbabweans can find each other again as they did in the 1960s and 1970s when they joined hands against the colonial forces; Zimbabweans can find each other again like they did when the signed the unity accord and stopped the self-destruction in Matabeleland and Midlands; Zimbabweans can find each other again like they did when the produced the current national constitution; Zimbabweans can find each other like they did when they shared power during the government of national unity. There is no chasm that is too big not to be crossed through the power of reconciliation. Without reconciliation and openness to a process of shared national envisioning, we are all doomed. We can either take the current situation as a mere crisis to be resolved by a winner-takes-all mentality or we use this as an opportunity for us to find one another to build something that is permanently healing for our nation. The first option spells disaster for us and future generations. The second option allows us to embrace our situation as a Kairos, an opportunity given to us by God to dream together that another Zimbabwe is possible! ZCC Press statement on the current situation in Zimbabwe ... Read the Full Release.